The above section of sandbags consists of two straight pieces, two corners and one round. To buy all this, Six Squared Studios asks for just over $12 American. That is extremely affordable for some really nice terrain! Now, the pieces above do not come as one solid set. You buy these barricades piecemeal. Currently they have three different sections plus an additional piece with Battle Damage on it. That one is not yet painted up well enough for me to showcase though. That said, I didn’t see that one on their website at this time. Now, let’s take a look at the three sections I have. This Curved Barricade is what sold me on their Sandbags collection. It looks great, holds lots of models and is slightly larger than the curve sections made by most of their competitors. This guy is roughly $2.75 American. The Straight Away sections are exactly what you would expect. Each wall piece comes individually for roughly $1.95 American. Here we have two corner pieces assembled in a Zig-Zag Pattern. These ones run about $2.75 American each. I don’t know if you know of Six Squared Studios, but they are an excellent small company that makes really nice terrain products at very affordable prices. Check these guys out and you will find that gaming with awesome terrain doesn’t have to be expensive. Over on my personal site, Must Contain Minis, I have an entire area dedicated to posts about Six Squared Studios (or with their products in the stories). I also have a review of these very sandbags along with scale comparison pictures of Warhammer 40,000 models, and an interesting story showcasing these models on some paper terrain I reviewed. If you are interested in checking out their products, be sure to check out Six Squared Studios’ web store. They ship within the USA and Canada with fairly good rates. That said, I buy from them at local gaming conventions where I don’t have to pay shipping fees. They do ship outside of those two countries, but their shipping rates are not nearly as good for those outside of North America. 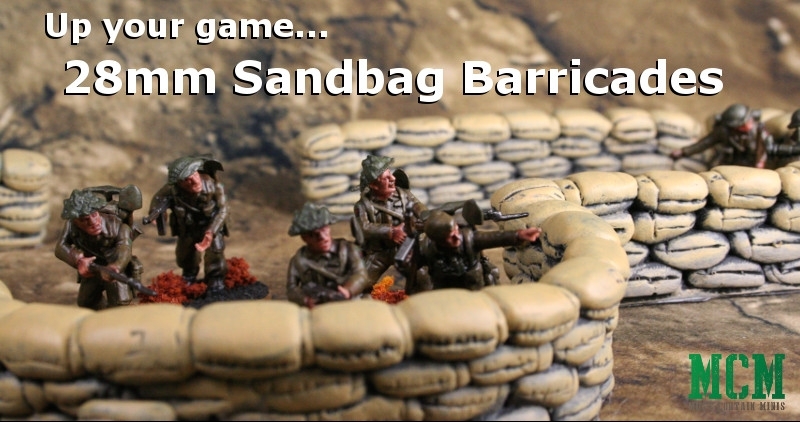 Hopefully you enjoyed this quick look at 28mm Sandbag Barricades by Six Squared Studios. While I use them for Bolt Action, I could see you using them for any number of games from Warhammer 40K right on over to Star Wars and other Sci-Fi and Historical Games. The pictures above were taken by me, Jacob of Must Contain Minis, with Bolt Action miniatures on a Cigar Box Battle Mat. This one happens to be their “Muddy Barren” mat.